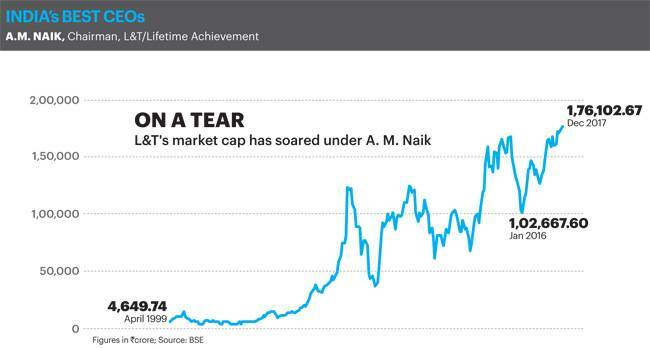 A.M. Naik transformed the company into a global engineering & technology powerhouse. Anil Manibhai Naik's life revolves around L&T. He has always been willing to talk passionately about the company and its future. A hard taskmaster, Naik set high standards for his staff while at the helm and is the man behind L&Ts success story. Naik, now the non-executive Chairman of L&T, has added another feather to his crowded cap. He's been conferred Business Todays Lifetime Achievement Award - a new category in our annual Best CEO awards.When Business Today met him at his corner office in Landmark building at Mumbais Andheri, Naik appeared keen on ceding the spotlight to his successor. "To know anything related to the current business of L&T, you will have to speak to S.N. Subrahmanyan (MD&CEO). My roles are different now", says Naik. Subrahmanyan took over in June 2017. Our conversation with Naik revealed that even after spending more than 53 years with L&T, Naik is still thinking about L&T and its businesses. The 76-year-old devotes most of his time to the company that he regards as his 'temple'. He regards himself as the 'keeper' of that temple. His unflagging energy is now focussed on evolving a new strategic vision for L&T. It includes deciding the business areas L&T should enter and exit in the coming years and how to make the company ready for a future rooted in high-end, next generation technologies. The target is to double the companys turnover by 2021. Then, he has taken on the task of training the next generation leaders for L&T. "I also spend time on my social work (Naik has pledged spending 75 percent of his earnings for charity) and taking care of my health, which I ignored while working almost 16 hours a day for the last 53 years," says the workaholic Chairman, who ensures most of his senior subordinates maintain a punishing schedule like him.Soon we realise, from the numerous calls he attends to, that AM Naik is still hands on at L&T and tracks where his key executives are, what they do and whom they are meeting. He always has been aggressive, assertive and authoritative both in business dealings and handling subordinates. In fact, it was Naik who made the Rs 1.2 lakh crore L&T an engineering behemoth, currently operating in about 85 businesses. After he took over as its CEO and MD in 1999, Naik professionalised the company, brought in entrepreneurial aggression into an entity that was working more like a public sector company and made it a part of the various initiatives that independent India is proud of - from satellites, major airports, defence projects (from nuclear submarines to missiles) to moon or mars missions. He also ensured L&T became a multinational, with 35 percent of revenue coming from overseas business. Since 1999, L&T's revenues have grown 25 times and market capitalisation by 85 times. Almost all marquee infrastructure projects in India are now handled by L&T. Whats more, Naik transformed an engineering company into a new age business conglomerate operating in diverse high end technology and engineering services, IT, finance, defence, infrastructure and of late, ship building, smart cities and water. "There may be specialist engineering companies in certain areas, but there is no company in the world which can do all that L&T does," says Naik with pride.Reliance Industries Chairman and Managing Director Mukesh Ambani, who closely knows Naik for the past 35 years, since he was a general manager with L&T, points out that some of AM Naik's best qualities are his engineering brain and passion to take L&T ahead of the competition. "I still remember that in the middle 80s, we had a Japanese compressor. It was a titanium and we had a problem. I called Mr Naik and he said I will fix it for you. Within six days, we fixed the problem in India," said Ambani recently at a function in Mumbai to launch Naiks biography, The Nationalist. When L&T was confined to just a single engineering workshop facility at Powai in Mumbai, Naik had the vision to create new big engineering facilities to accommodate the needs of the future. In 1980s, he created the huge Hazira engineering complex, now spread over 755 acres in coastal Gujarat, and followed it up with a knowledge city in Vadodara. Currently L&T's facilities are spread across the country in different locations, with the latest available facilities and technologies, and have an imprint of his vision.Independent observers say Naik's stature has grown beyond even the Danish founders of the company - Henning Holck Larsen and Soren Kristian Toubro - who founded L&T way back in 1938. That is mainly because Naik successfully fought hostile takeover attempts by two of India's leading corporate houses in early 2000s and made its employees the largest shareowners. For that, he floated an L&T Employees Welfare Trust, a way to ring-fence any future takeover attempts, which eventually helped many employees become millionaires through stock options.Such battles were not new to him, a natural leader and organiser. At school, where his father was the headmaster, he had led an agitation of students to improve the quality of English education. Even the decision to quit his first job at Nestor Boilers in Mumbai after a year was a fallout of a revolt against the humiliation of a very senior colleague by the then promoters son. "In my career, I had fired thousands of non-performing employees, but I never insulted or humiliated them. Many of them still respect me and they could come up in life as they realised their mistakes," says Naik.Naik is a seasoned street-smart CEO. After joining L&T as a junior engineer at a salary of `670 in 1965, he soon became the most commanding voice in the company. He still maintains that there are not many CEOs in India who have such a cordial relationship with the staff, from top executives to foremen in the shopfloor of their factories. Unlike most CEOs, who are afraid of speaking against the government, Naik is very often critical. "That is because my role model is my father who always told me to stand for virtue, values and what is right", says Naik.Also, unlike many Harvard or Wharton educated CEOs, who get the top job simply because they belong to the promoter clan, Naik had to fight his way to the top. He studied at a tribal area school in Gujarat and a nondescript engineering college, Birla Viswakarma Mahavidyalaya, Anand. In his first job interview itself, Naik was told to improve his crude English to survive. A hardworking Naik listened to audio tapes and rehearsed before the mirror to improve his English skills. In the initial five years at L&T, his hardwork earned him a good salary and five promotions to become an assistant general manager. Then there was a phase when he was denied promotion for almost a decade as the company slipped into the hands of seniority conscious bureaucratic leaders. "I am not someone who bothered much about promotions or wealth and my ambition has always been to work for L&T", says Naik. Indeed, he would be known in history as the man who moulded the modern L&T.